my second theme, hope you enjoy it. please comment when something needs to be changed. First theme I've ever made so feedback is much appreciated. 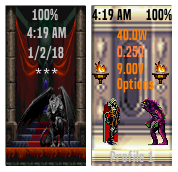 Its based off my favorite video game Castlevania Symphony of the Night. All of the backgrounds and sprites have been ripped from the original ps copy of the game. Couple of fancy features with this one. Alucard attacks the merman when the mod is fired. Fires light on the backwall of main screen while charging. 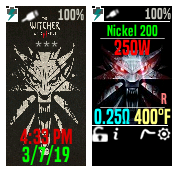 The petrified sprite on the lock screen also changes depending on battery level.